Big tech, digital surveillance, and the authoritarian threat of an overzealous Border Patrol. Nope, it's not the headlines — it's Down the Brink, the recently published dystopian-tech-legal thriller from sponsor Lisa von Biela. Dark as this story is, you'll be instantly engaged by Zach, Gil, and Aggie, whose lives intersect around an immensely powerful prison system and a seemingly harmless app. Lisa von Biela is a local author with professional experience in both the law and IT. That gives her writing bite: You can't put her books down, not just because they're great storytelling (and a fabulous summer read, if dark fiction is your jam), but because the thrills are just a little too close to home. 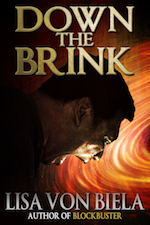 Check out this sample from Down the Brink, and you'll see what we mean. Sponsors like Lisa von Biela not only bring great events and new releases to your attention, they make the Seattle Review of Books possible. Did you know you could sponsor us, as well? If you have a book, event, or opportunity you’d like to get in front of our readers, find out more, or check available dates and reserve a spot.